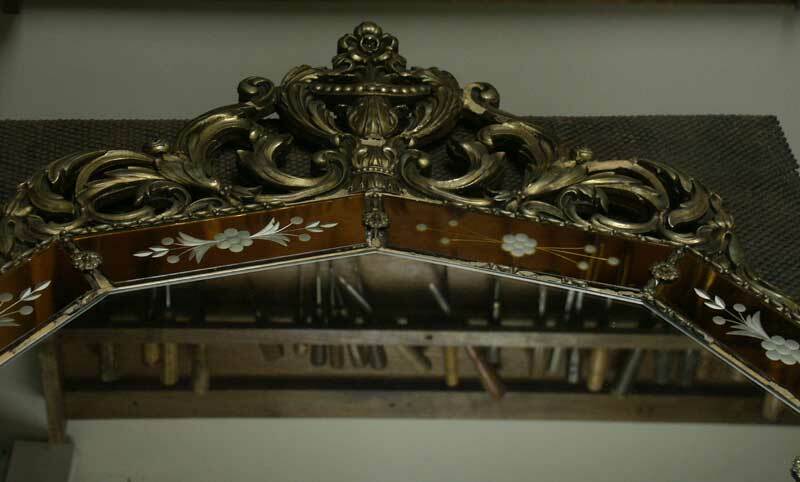 Never pickup a delicate piece by it's fretwork. 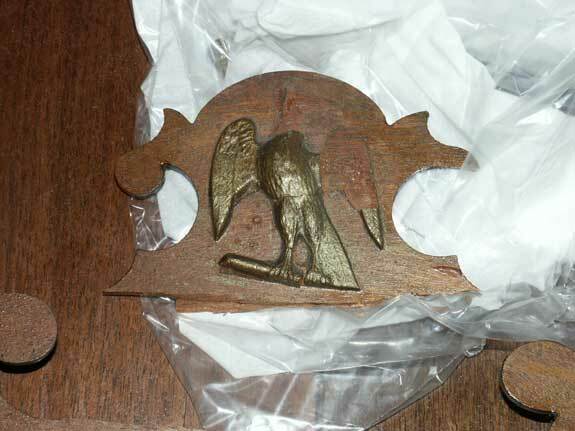 The eagle on the bonnet of this mirror was snapped off and damaged by mishandling. 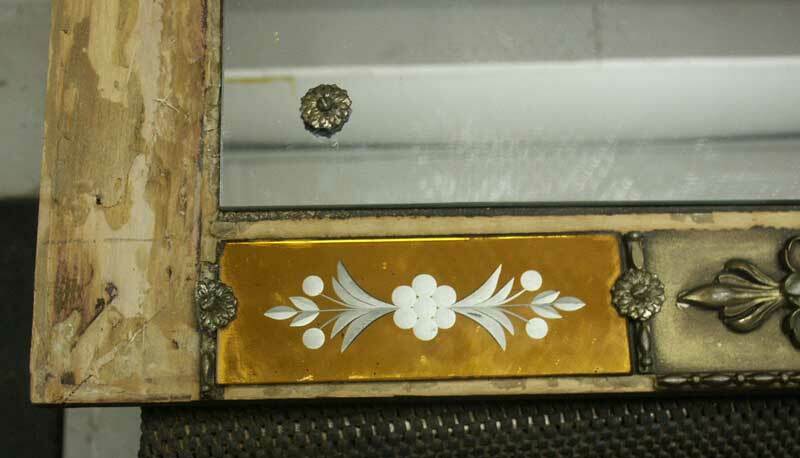 Fortunately all the critical pieces were saved and packed away to allow for restoration - this is a key factor! 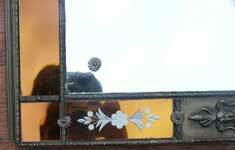 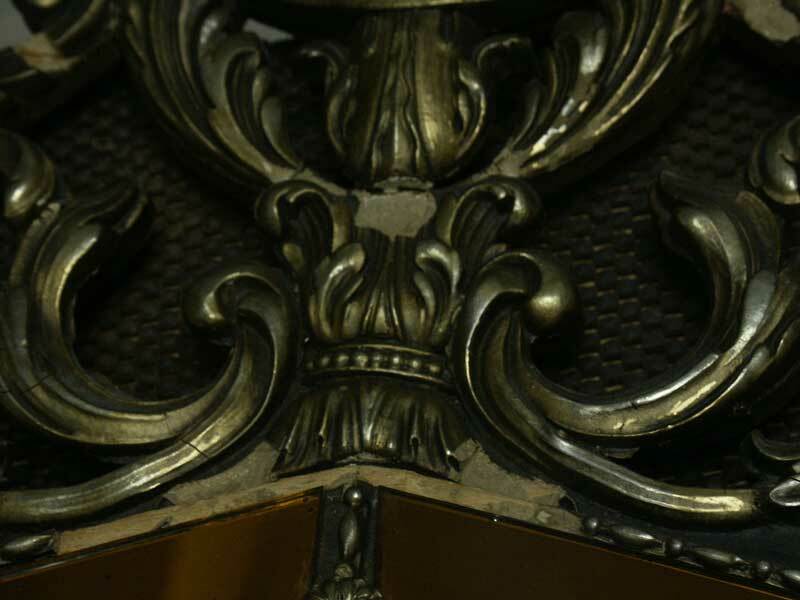 It keeps down cost and ensures that the piece is restored as close as possible to the original condition. 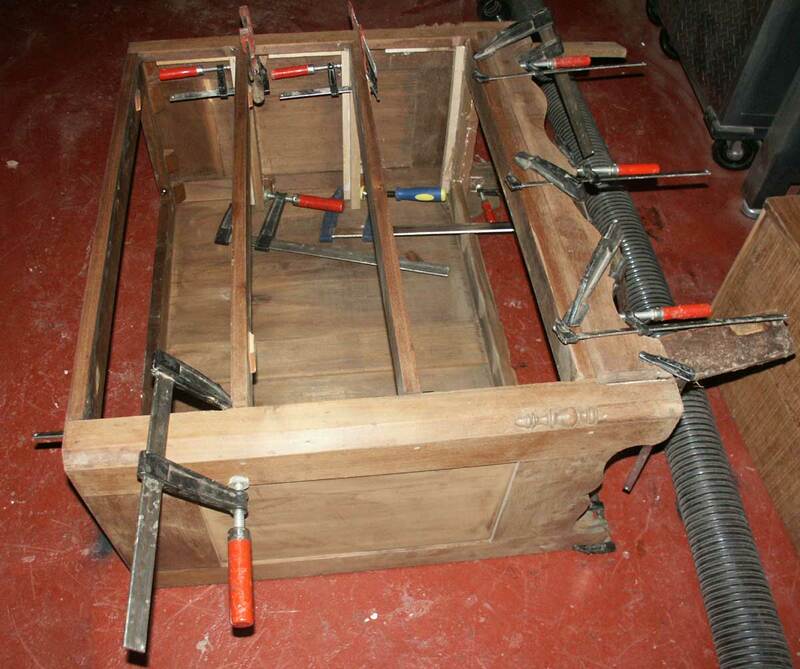 Make sure you carefully find all the parts and pieces, place them in a zip lock bag in a small box! This is an interesting piece, stained glass, gesso, carving, guiding, and a mirror. 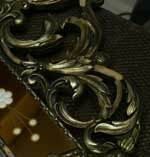 Large sections of gesso are missing, as well as some of the stained glass. 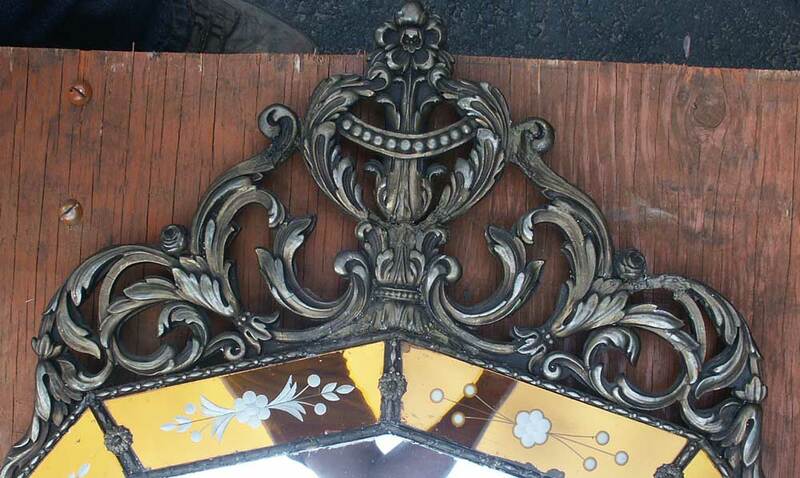 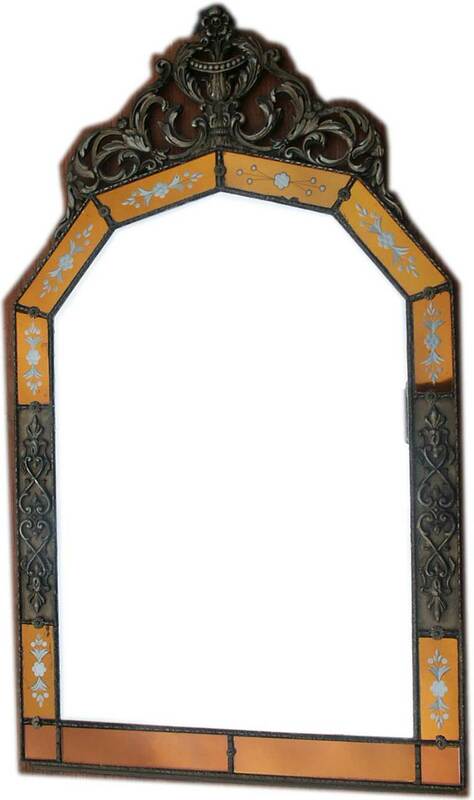 Now restored - we located stained glass to match the missing pieces and restored the gesso moldings and carvings. 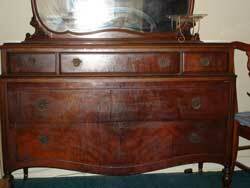 This type or restoration is time consuming and tedious. 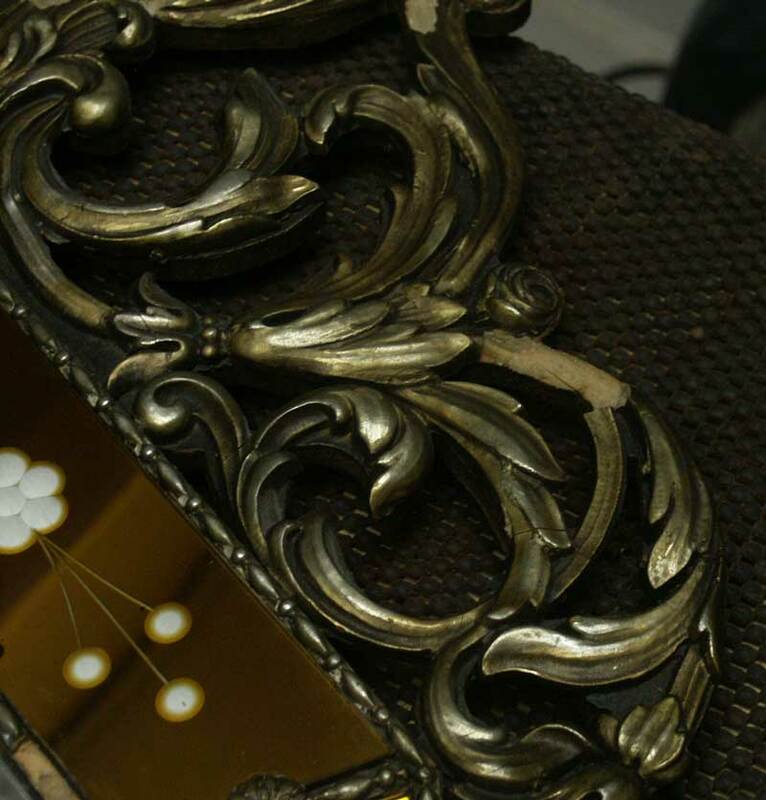 We take our time, and save these for rainy days! 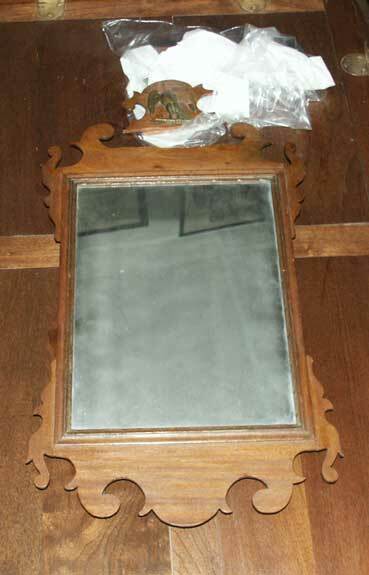 There are huge numbers of these type of pieces floating around in ding rooms, basements, living rooms, family rooms, and probably a few in the garage or shed. 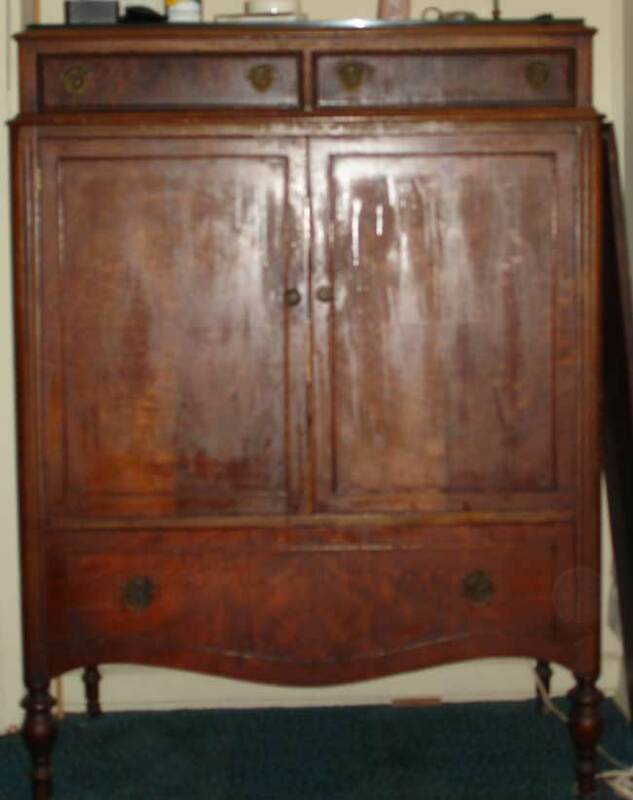 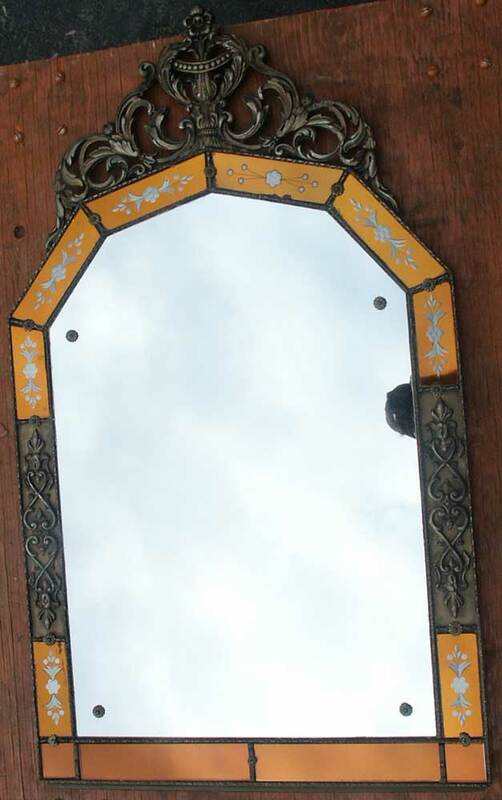 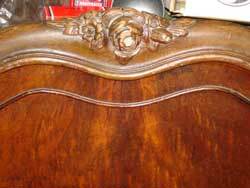 These pieces are generally made overseas, they are not highly priced, but they are very well made and often cary a patina over all solid wood with hand carved accents. 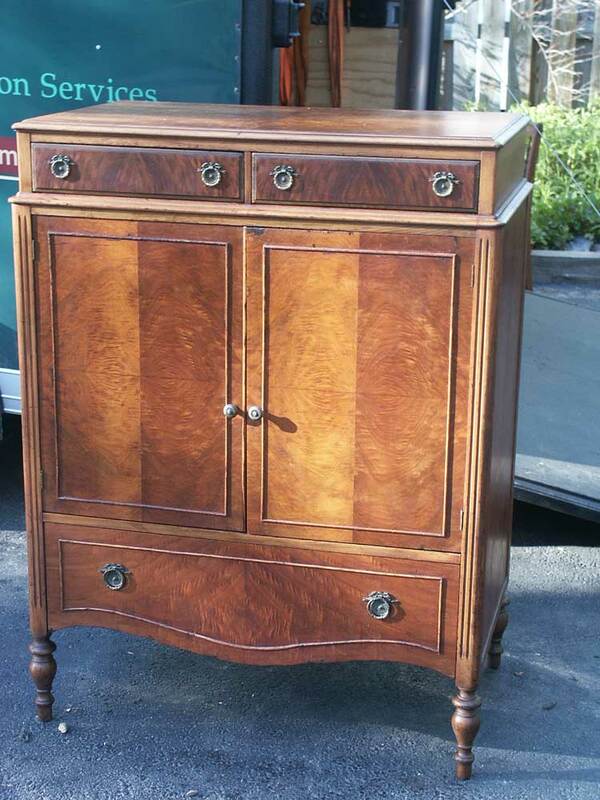 The piece was repaired, refinished, and now resides proudly placed center stage as a dining room server. 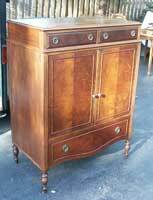 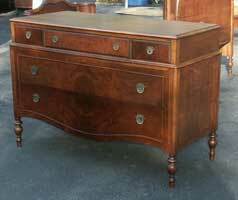 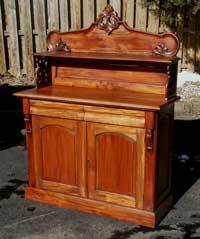 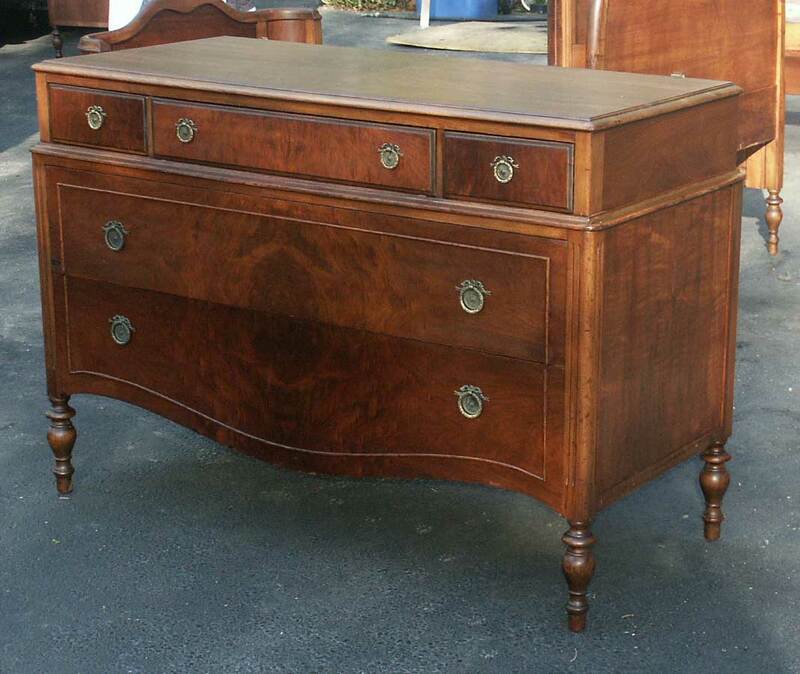 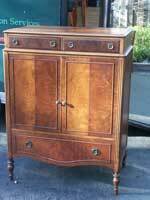 These mahogany dressers are part of a full bedroom set. 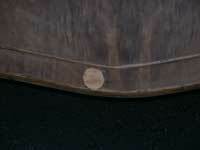 Arriving early in 2006 the project was completed by summertime. 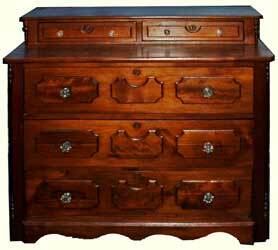 This set is all book matched flame mahogany. 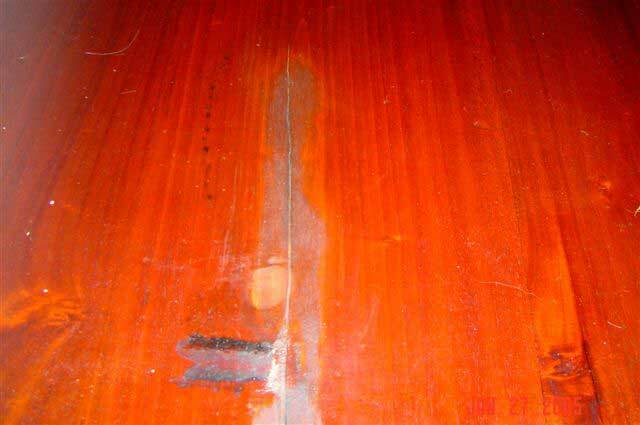 There are some amazing works of hard hidden under years of deteriorated lacquer. 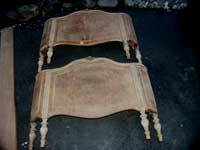 Photo on the left shows before restoration, the two on the right show the completed restoration. 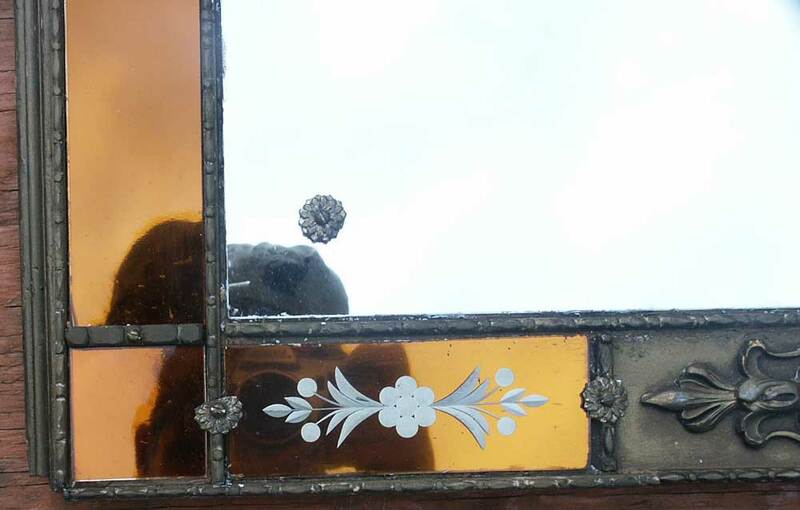 Below, some photos in progress. 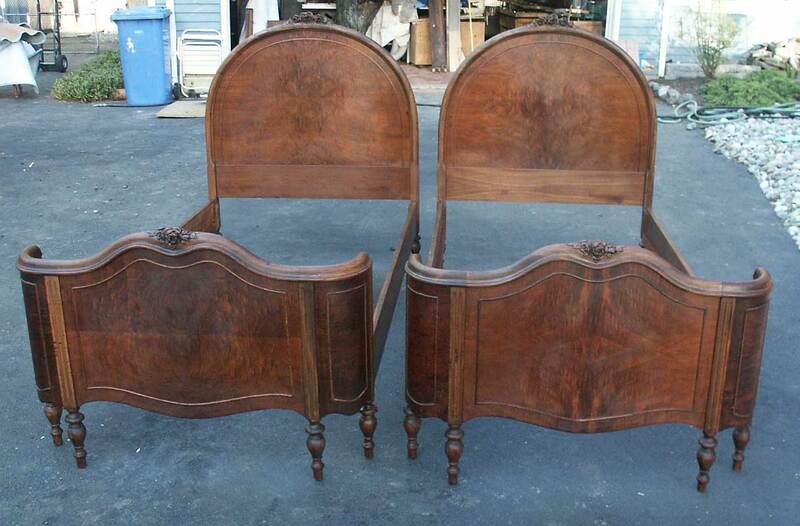 Beware of throwing out sets like this, and always be on the lookout for one on the roadside or at a yard sale! 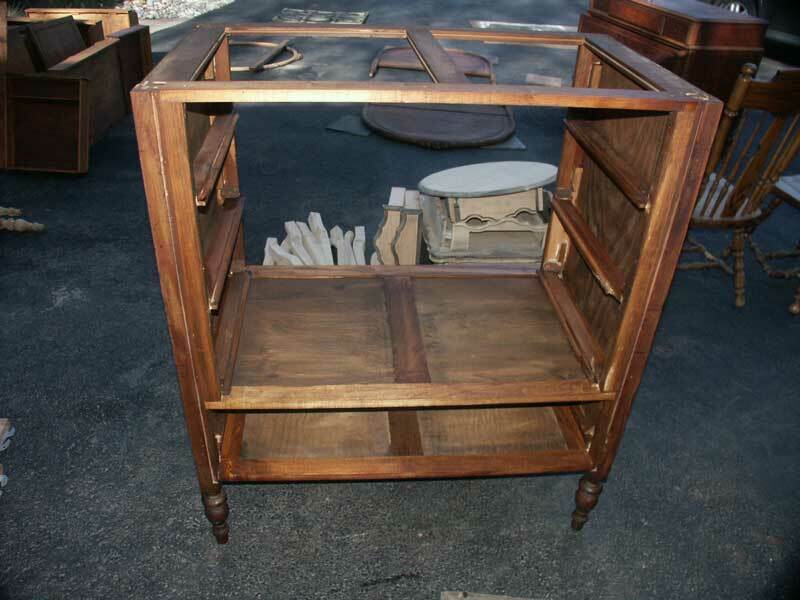 Follow the snapshots below to see this set turn from a rummage sale feature to a showpiece. 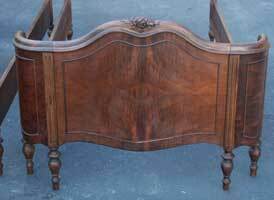 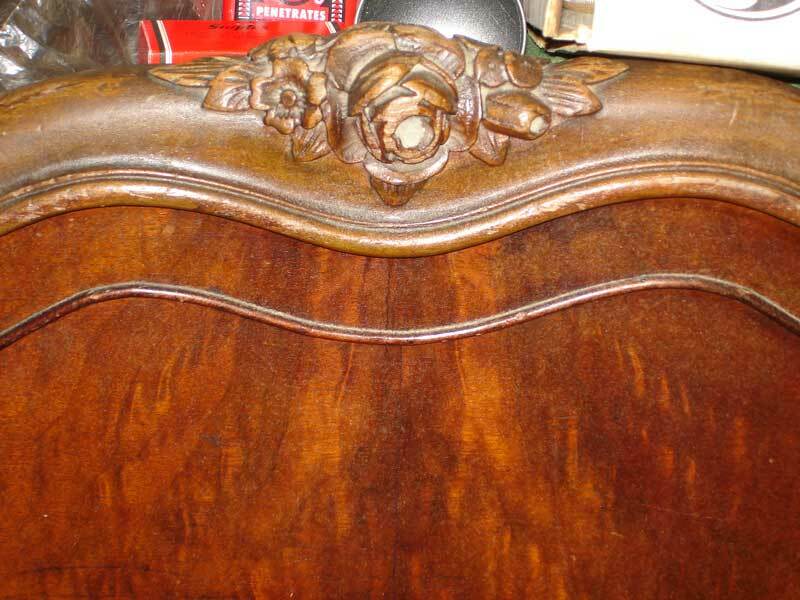 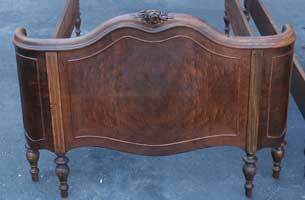 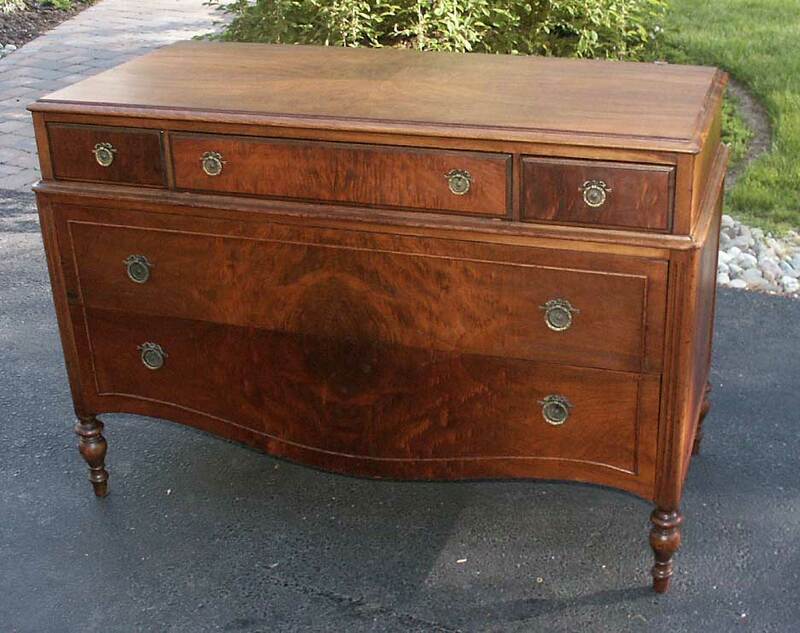 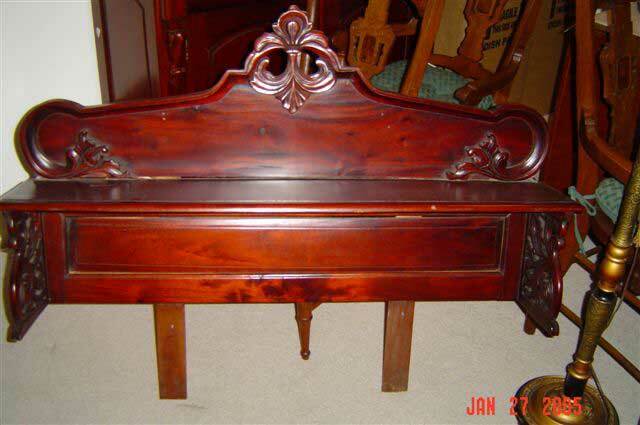 Above, the dresser before restoration, below - three photos of the completed piece. 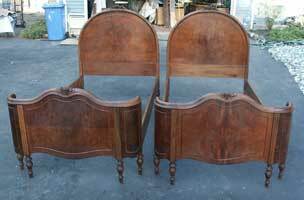 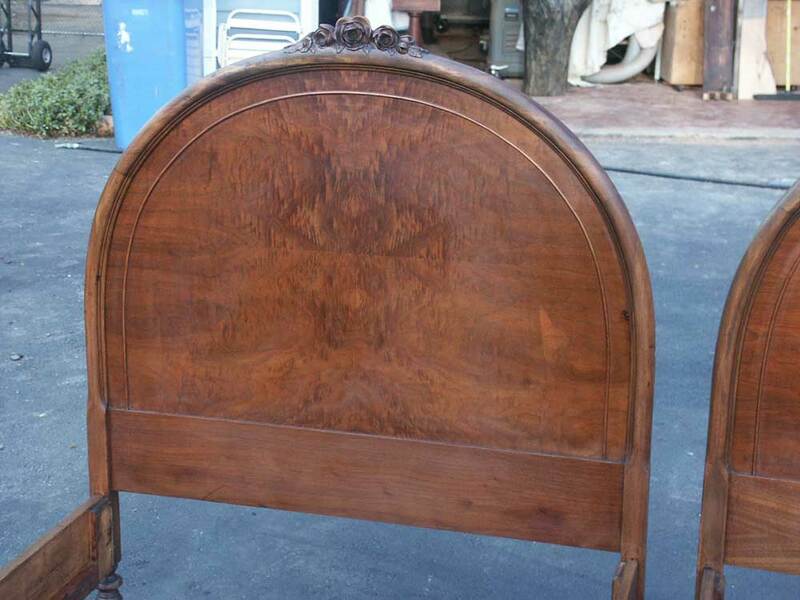 These twin beds (shown left before restoration) went through a complete refinishing and restoration. 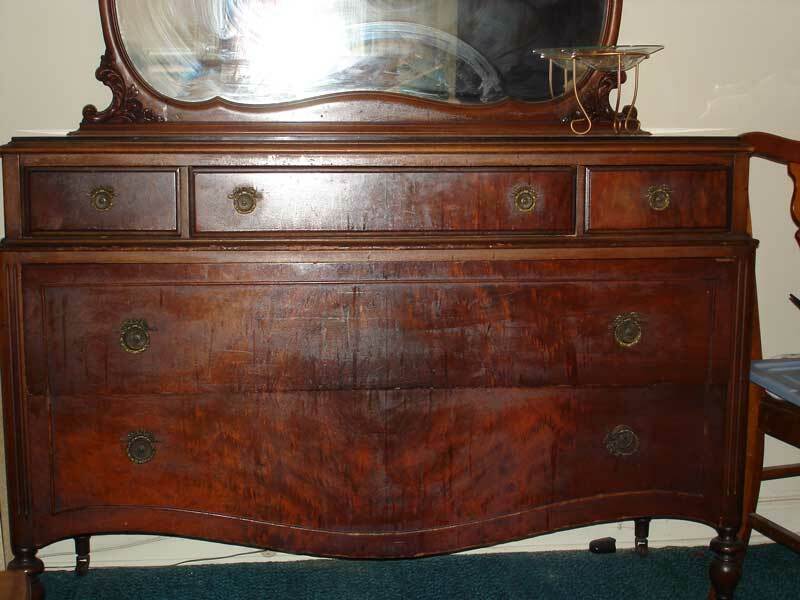 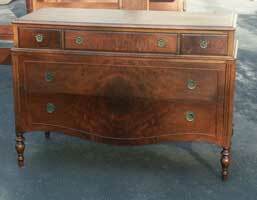 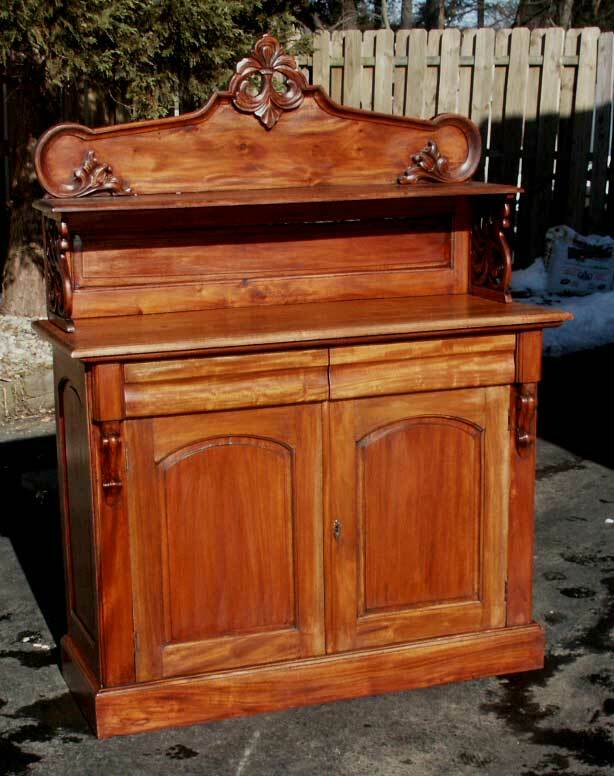 This circa 1860 dresser appears to be European walnut, which restored and refinished beautifully. 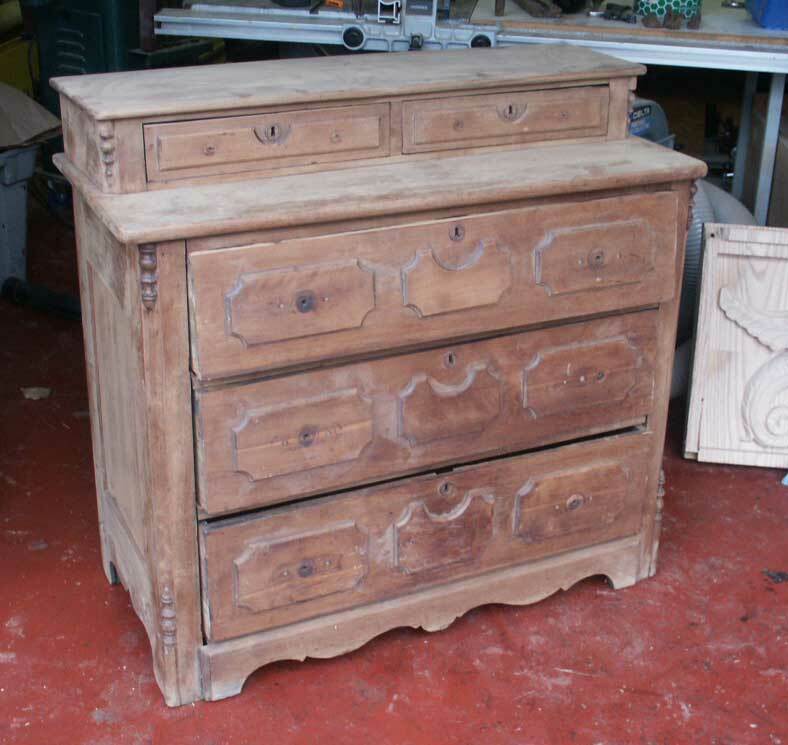 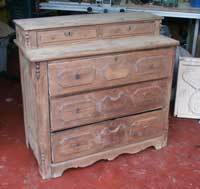 This dresser was as loose as they come, almost ready to fall apart in a heap where it stood. The dresser was entirely broken down to a shell. 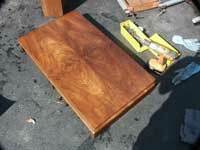 All the glue blocks popped loose, surfaces cleaned, and new glue applied. 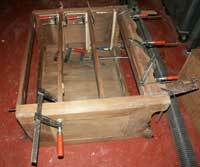 Every drawer was pulled apart, new runners were glued in place for each of the slides. 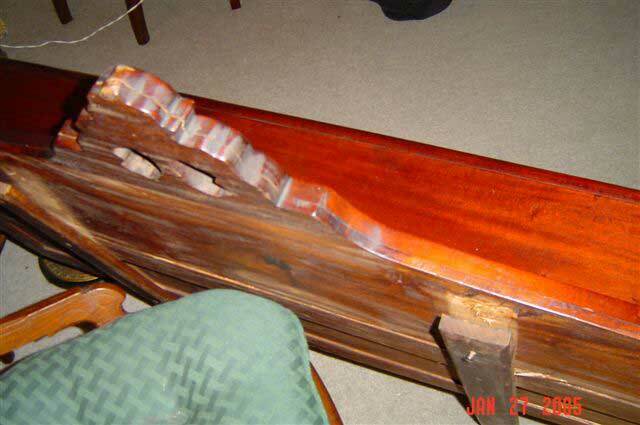 Someone had actually driven nails strait up through the runners causing a nasty carving affect and destroying all the original wooden guides. 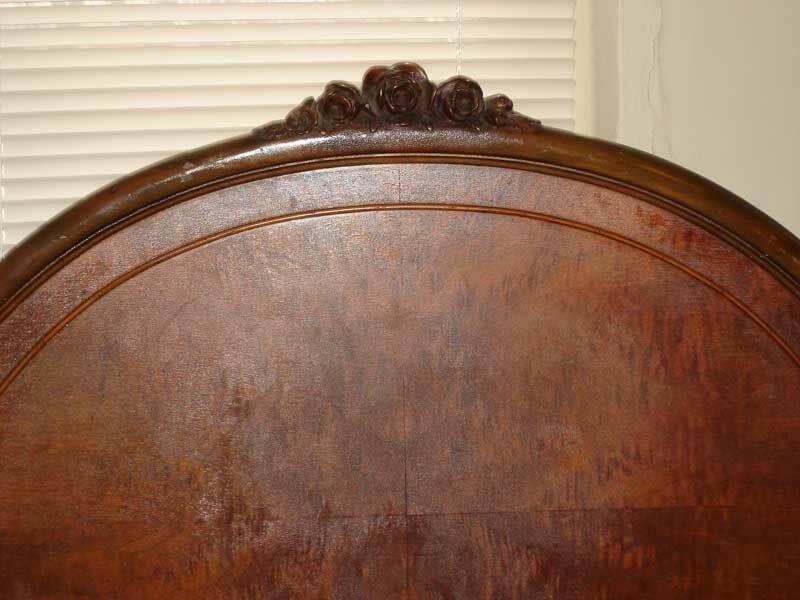 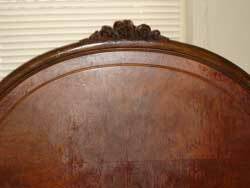 Once the whole piece was knocked apart and re-glued it was sanded down, cleaned of residues, and then moisturized inside and out with a coat of Minwax Early American. Four coats of tung oil later, it's back to excellent condition.